Does back pain make long hours sitting in front of a computer unbearable? Does it keep you from playing your favourite sport? Have you had to take time out of work, or undergone surgery, with little or no relief? Have you tirelessly experimented with various therapies to relieve your back pain? Research studies show that 80% of people in industrialised nations suffer from lower back pain severe enough to consult a health professional or use drugs to relieve pain or reduce inflammation. As the saying goes, prevention is better than cure, and though it can be treated medically it is always better to take precautionary steps to avoid it and change the way you are using yourself, which is the most common cause. Chronic back pain can be caused by injury, inactivity, stress, misunderstood body mechanics or poor posture. Often treated with osteopathic or chiropractic adjustments, massage, medication or surgery, this frequently only provides short term symptomatic relief. Though each of these approaches can have a valuable role in recuperation, the Alexander Technique helps you address the cause of your back problem by helping you change your movement style. Do you slump when you sit? Then you are overworking some muscles and under using others. This muscular imbalance is evidenced by a collapsed or rigid posture. If you over-arch the back or bend at the waist rather than the hip joint, you are unconsciously compressing spinal vertebrae. Sitting for sustained periods is the most challenging activity for the human spine, and it is how most of us spend our days. The Alexander Technique is a proven method of self care that reduces pain, increases your mobility and provides long term relief. It gives you an understanding of the body's fundamental design and a way to move that will help you feel better, on your own. I listen to your symptoms, seeing them in the context of your entire movement pattern. Through keen observation of the body's dynamics in movement, I focus on how you move as you function. You can then use the Alexander Technique to move safely and sensibly. 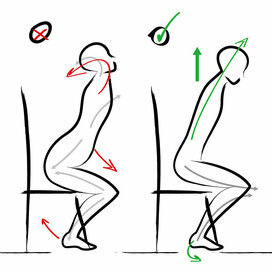 Rather than slumping, you can learn to sit balanced and upright without strain. 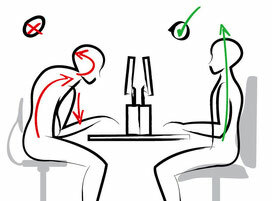 The Technique enables you to reduce overuse of the body's surface muscles by engaging the deeper postural muscles. Walking, sitting, using a computer, lifting, getting out of bed or a car - you learn to do all these routine activities, pain-free. Since study of the Alexander Technique helps you increase sensory awareness, you become more attuned to your body's warning signs of tension and compression. You acquire the capacity to lessen or prevent episodes of pain, enabling you to decrease your dosage of painkillers or anti-inflammatory medications. You demystify your back problem; you understand where it comes from and how to change it. 87% of back problems are known to be muscular in origin, meaning they are caused by how you move your body and use yourself. In a survey of back pain patients, 75% of those who were told they needed surgery recovered successfully without it using the Alexander Technique. In a 1988 study by the British Holistic Medical Association of those who suffer from chronic pain, they expressed their preference for the Alexander Technique as their favourite approach to long-term pain relief. 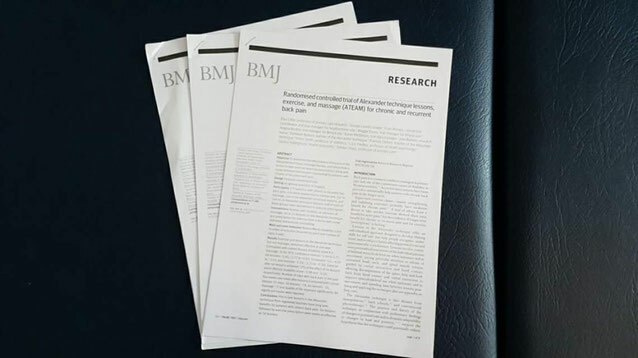 In 2008 an NHS funded gold standard randomised trial on long term and recurrent back pain carried out by Southampton University proved that the Alexander Technique was clinically effective. The results were reported in the British Medical Journal. The Alexander Technique combines well with other elements in a back rehabilitation program. It can help you recuperate from surgery, derive the maximum benefit from your fitness program and help you improve how you do your physical therapy exercises. It can also extend and build on the initial benefits of osteopathy, chiropractic, massage or acupuncture. Most importantly, it gives you the ability to relieve and prevent your own back problems. Instead of wondering why you are flat out on the sofa after picking up the TV remote, you move through your day with more confidence, poise and ease.